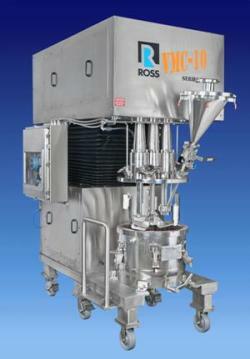 The Ross Solids/Liquid Injection Manifold (SLIM) is a high shear mixer system designed to accelerate the dispersion of hard-to-wet-out solids while eliminating floating powders in batch tanks and reducing dusting in the mixing area. Powders like fumed silica, CMC, guar gum, carbon black, carrageenan, xanthan gum, talc, pectin, flours, clays, carbomers and other rheology modifiers can now be mixed into liquids quickly and economically, requiring no filtering step after the mixing operation. Compared to other powder injection systems that rely on an external vacuum pump to establish vacuum in the mix vessel, the SLIM system utilizes a specially engineered rotor/stator assembly that generates its own powerful vacuum to draw solids sub-surface. This method of powder induction allows the operator to inject powders at a fast but controlled rate for highly repeatable and superior dispersion results. In the SLIM, powders encounter the liquid phase not only sub-surface but also under intense shear conditions. With conventional mixing systems, it is quite common for operators to contend with either a long cycle time or less than ideal product quality due to inadequate mixing. In the extreme cases, powders are intentionally overdosed and the undispersed agglomerates are simply filtered out. By preventing the formation agglomerates or "fish eyes" in the first place, the SLIM ensures maximum yield of the solid components. Revealing their full functionality through efficient mixing lowers raw material costs and eliminates downstream filtering or rework operations. Shown is a Ross Sanitary Multi-Shaft Mixer equipped with an anchor agitator, a saw-tooth disperser and a SLIM rotor/stator. Powders are fed through the SLIM hopper and, as soon as the rotor reaches operating speed, the hopper valve is opened to allow the flow of solids into the shear-intense region within the rotor/stator assembly. Call 1-800-243-ROSS(7677) to schedule a no-charge SLIM demonstration at the state-of-the-art Ross Test & Development Center or to discuss your application with a Ross mixing specialist.